Common Millet is an annual, generally from two to four feet high. The stems are erect or ascending from a decumbent base, rather stout and covered with outstanding hairs. The leaves, which are also hairy, are flat and broad. The flowers are in large panicles, which are often drooping and contain a great number of spikelets. As a rule these are bright green, but occasionally they have a blackish or purplish tint. Each spikelet contains a single flower with a bright red pistil. The wild plant from which the cultivated Common Millet originated is not known; its cultivation goes further back than history. The Swiss lake dwellers grew it as early as 2000 B.C. and it has also been traced to the lake dwellings of Italy. It is cultivated in eastern and southern Europe, and is of great importance in east and south Africa. It was introduced into America rather early, but has never been extensively grown in Canada. Like all other long-cultivated plants, Common Millet occurs in a large number of varieties, differing from each other especially in the shape and structure of the panicle and the colour of the seed. In some the panicle is open and erect, in others it is compact and headlike. Broom Corn Millets have a spreading and drooping panicle which resembles the seed cluster of Broom Corn. The names of other varieties, such as White and Red French, refer to the colour of the seed. Common Millet is better suited for human food than any other of the millets mentioned. It is largely grown for that purpose in the eastern parts of the Old World. Before the potato was known it furnished the main part of the poor man's food in central Europe. At present it is of practically no importance there as food for the people. In North America it is used exclusively as a forage plant. When intended for hay it is important to cut it at the right time. 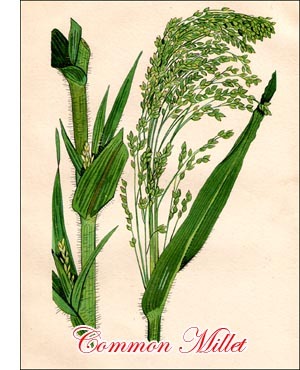 It has its highest nutritive value when in bloom; after that the quality of the hay deteriorates rapidly. When sown for hay or pasture, thirty pounds of seed should be used per acre; when grown for seed, twenty pounds are sufficient.